The biggest problem with Deoles is that they are not ready to change over time. They do not want to come out of their shadow, whereas Hindi cinema and its audience have changed a lot in the past few years. Even in the commercial format, they are not able to make the right films. 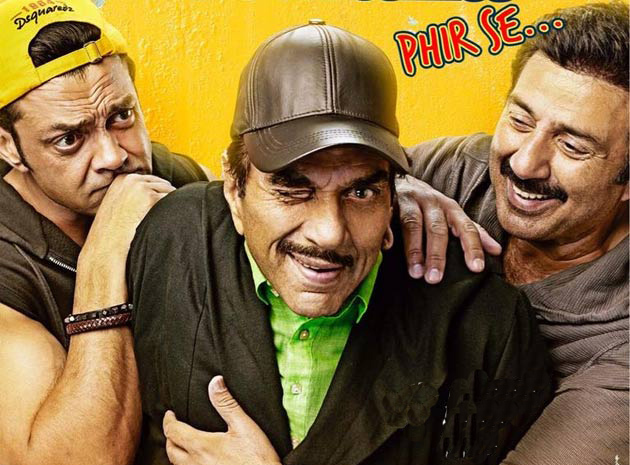 Seven years ago, Dharmendra, Sunny Deol and Bobby Deol made a comedy film called 'Yamla Pagla Deewana' which was liked. Simply, Deoles thought that his hand has been a success formula and he tried it again and again. Puran (Sunny Deol) is a Vaidya who lives in Amritsar with his crippled brother Kali (Bobby Deol). Parmar (Dharmendra) is a lawyer and is a renter of Puran. 'Vajarkavach' created by Puran is an Ayurvedic medicine that makes everyone healthy. Marfatiya (Mohan Kapoor) runs a medicine company in Surat and wants to earn crores of rupees after getting the Vajraakavacha formula. He offers millions of rupees to sell formula to Puran, but Puran does not believe. A girl named Chiku (Kruti Kharbanda) sends her to learn Ayurveda near Marfatiya and Puran. During this, Chiaku steals that formula. Marfatiya registers Vajarkavach and registers notice to Puran that she is misusing her medication. Puran, Kala and Parmar go to Gujarat to prosecute them. A person named Dhiraj Ratan has written this childish story which children do not even like. The special thing is in this talent of endurance that millions of rupees have been set up on their story. 'Chuzi' artists got ready to work on it and got released as a movie called 'Yamla Pagla Deewana Again'. Nobody raised questions on this lousy story? Hearing the old hit songs, like Seen laughs for the first time, but this scene is repeated repeatedly in the movie, then irritation arises. It seems that the Writers' Treasury was very quick and it has nothing to offer to him now. The film is shift from Punjab to Gujarat, then the patience of the audience starts to answer. Seeing the humor that the court has tried to create, the people of the film are passionate about their interest. What do they want to show? After all, how can they believe that such scenes / dialogues will make the audience laugh? Navneet Singh has failed miserably as a director. The scenes filmed by them are extremely long and boring. Like a lousy TV serial, he made the film. He could not even connect the audience with the movie. They have not been able to use properly till the superstar like Salman Khan. Sunny Deol is the biggest star of the film, but she did not get the chance to do anything in the film. People came to see Sunny and more than that was spent on Bobby. Fit Scene is the USP of Sunny and this feature of Sunny has not been raised too. Dharmendra should avoid such kind of rolls. Bobby Deol romanced, sang songs and made different faces in the name of comedy. Krrti Kharabanda remained well. If there were no rolls of Satish Kaushik, Shatrughan Sinha, then it does not matter. Technically the film is weak. There is no particular thing in cinematography. The songs work as 'break'. Editing is extremely loose. At least half an hour the film could have been reduced. It should be expected that the 'Yamla Pagla Deewana' series will be called 'The End' and Deoles will think something new.